This year the Department of Mathematics and Statistics is celebrating its 100th year anniversary. The Department of Mathematics and Statistics at the University of Toledo offers graduate and undergraduate programs in both Mathematics and Statistics. Currently the Department has about forty full-time graduate students and thirty full-time faculty with a wide range of research interests. The University of Toledo - merged in 2006 with the Medical University of Ohio - has over 20,000 students, 7,000 employees, and the third largest operating budget of Ohio public universities. 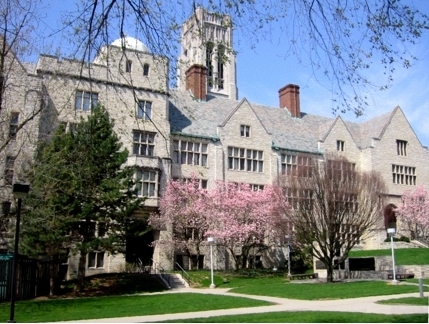 The Department is housed in University Hall - built in the Collegiate Gothic style and completed in 1931 at a cost of 2,000,000 dollars. University Hall was designed by the architectural firm of Mills, Rhines, Bellman and Nordhoff Inc.; 400 workers took 11 months and used 50,000 tons of limestone to complete the 63 foot tall building and its 205 foot tower. Generated on: 2019-04-18 18:10 UTC.